You are currently browsing the tag archive for the ‘boemboe bali’ tag. 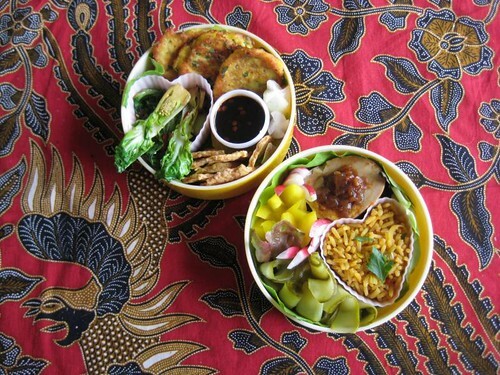 Indo food is great for bento because it can be eaten at room temperature. I had some leftover corn kernels so I was dying to try a new recipe for perkedèl djagoeng (which in contemporary spelling would probably be ‘jagung‘). I’ve been on a quest to find the perfect recipe, but hadn’t made any for a long time. This one’s great! I want to try some more recipes but I’ll share this one now (slightly adapted). It’s one of the best so far! Mash onion, garlic, kemiries, salt and pepper together in a mortar to create a boemboe (pulp). If you don’t have a mortar you can also chop them up real fine or use a food processor. Mix everything together: boemboe mixture, mashed corn, egg, flour, leek and celery. Heat the oil and bake the corn fritters; approx. a spoon of batter each. Combine all sauce ingredients into a dip. I’m afraid the source of this recipe is unknown: it’s a photocopy of a page in an old library book, but I’m guessing it originates from a Bep Vuyk Indonesian cookbook. 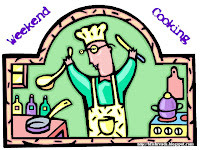 Why don’t you join Beth Fish’s weekend cooking with a food-related post?